I love that! One of my favorite parts of fall! cute cute picture!! i took some good ones of my kids last fall but don't have enough yet this year. I can't wait til we have enough leaves to rake them up and take pictures with them. I love fall leaf pictures!! Lovely pictures. I love autumn! Great photo, capturing it well! What a wonderful picture!! I love fall!! What a great photo! 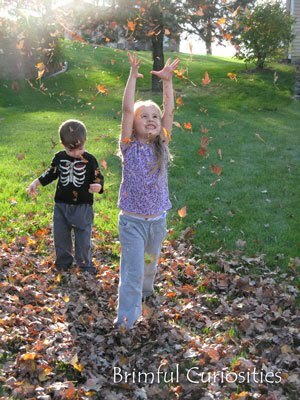 How fun to play in the fall leaves.